You may have heard skin flushing is a side effect of high-dose niacin supplements, or that niacin helps flush your body of toxins, drugs, and other substances. But does science back up these claims? The answer might surprise you. Can Niacin Detoxify Your Body? Believe it or not, taking niacin supplements may aid in the detoxification process by enhancing your body's blood flow and ability to sweat. However, more research is needed in the realm. A 2011 review published in the Journal of Alternative and Complementary Medicine says a detoxification program for World Trade Center rescue workers using niacin (in combination with sauna use, exercise, and nutrient and electrolyte supplementation) did seem to lower levels of chemicals in blood and fat cells. Another review published in 2012 in the Journal of Environmental and Public Health found taking niacin helps with vasodilation (blood vessel widening and increased blood flow), which appears to enhance sweating in well-hydrated patients with high levels of toxins their bodies. Taking niacin for vasodilatation works best when combined with exercise or sauna use to enhance the sweating process, which helps accelerate detoxification. Does Niacin "Flush" Alcohol and Drugs? More research is needed to determine if niacin is effective for flushing alcohol and drugs out of your system at a faster pace. MedlinePlus says niacin is sometimes used to prevent positive drug tests in people who use illegal drugs. However, while some online sites recommend taking niacin to pass drug tests, research is lacking in this area. Because studies pertaining to environmental toxin detoxification show niacin could be beneficial, this vitamin supplement may be useful for drug and alcohol detoxification, as well. However, MedlinePlus warns to avoid drinking alcohol when taking niacin supplements, because alcohol can make skin flushing worse, and alcohol combined with niacin increases your risk for liver damage. Mayo Clinic says while some people take niacin for reducing drug-induced hallucinations, safety and effectiveness is based on theory and needs further investigation. Furthermore, the University of Maryland Medical Center says niacin can interact with certain medications, so avoid taking large doses without first checking with a doctor. The most common type of flushing your body may experience from high-dose niacin supplementation is skin flushing (burning, tingling, warmth, redness, and itchiness). A 2009 review in the International Journal of Clinical Practice says the reason niacin causes flushing is it activates receptors in your capillaries (blood vessels), causing blood vessels to dilate (expand) and an increased blood flow. Authors of the review say skin flushing from niacin generally lasts about an hour, and flushing generally decreases about a week after you begin niacin supplementation. Take small doses of niacin spaced evenly throughout the day to help decrease flushing as it can sometimes be uncomfortable. Time-release forms of niacin are also available. In addition to skin flushing, you might experience several other side effects from taking high doses of niacin supplements if you use it for detoxification. Niacin is commonly used for treating high cholesterol and is available as a prescription cholesterol -lowering medication. 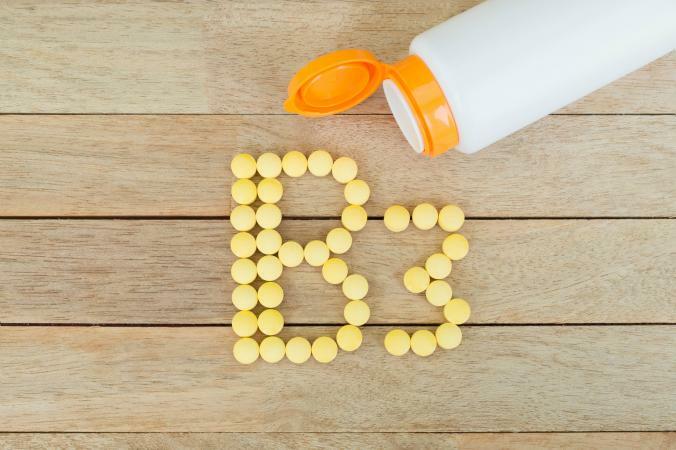 The University of Maryland Medical Center says niacin has effectively treated low density lipoprotein (LDL, or bad) cholesterol and triglyceride levels. Niacin is also used to help treat or prevent pellagra, a condition caused by niacin deficiency. Because science doesn't necessarily back the claim niacin flushes your body's system (although it may be beneficial as part of a generalized detoxification program), it's best to follow general niacin dosing recommendations. The RDA for niacin is 14 milligrams for women and 16 milligrams daily for men. You can meet this requirement by eating niacin-rich foods and taking a multivitamin supplement containing at least 20 milligrams of niacin daily, which is what the Linus Pauling Institute suggests. Avoid exceeding the tolerable upper intake level (35 milligrams per day) unless your doctor recommends it or prescribes niacin for high cholesterol or niacin deficiency. Does Niacin Work for Detoxification? Based on limited available research, niacin may aid in detoxification due to its effect on blood vessel dilation, which could increase your body's ability to flush out toxins (especially when combined with sweating from exercise or sauna use). However, more research is needed to determine safety, effectiveness, and dosing guidelines. While niacin appears to be effective for reducing high cholesterol levels, avoid taking high doses for detoxification unless your doctor recommends it because serious side effects may occur. The best way to detoxify is to drink plenty of water, eat clean, take a multivitamin supplement containing all essential nutrients, work out and sweat regularly, and steer clear or drugs, smoking, and alcohol.